Flowering in my back garden. Beautiful flowers TT, mine aren't opening today either, not enough sun! That just looks so cheerful. I'm moving down to where you live TT - it looks so much brighter down there. We have missed the snow here but its dull and freezing cold! but much has melted now.. Very nice :) Mine have all been buried alive! Beautiful & so bright, it looks as tho' the sun actually came out for a bit.Horrible here today, snow,sleet & very grey. I think I'm getting sad disease! Hello Feverfew .. thanks ..
Wow Tt these are gorgeous. I love yellow crocus but the birds tear them to shreds. I have a pot which are just coming up I may have to use a cover of some sort to be able to enjoy them for more than a day. They all complement each other so well, Terra! wow lovely TT, the garden and the flowers! A lovely potful of colour, TT! :-)) I like it very much! Gives me an idea for next year on the balcony! Yes, these would grow nicely on your balcony ..
great idea to try them there ! I love the color combo :) Your garden looks beautiful right now! 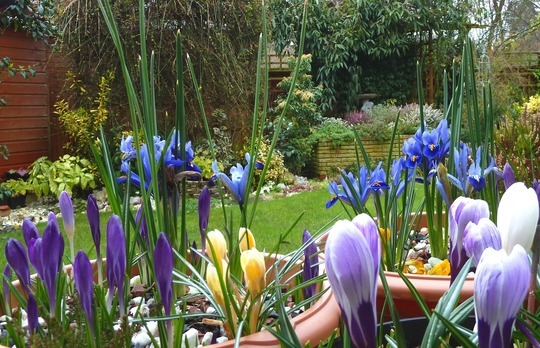 Good luck with your crocus and iris bulbs. Yes, this year it seems, in many countries, flowers will be in bloom later than usual ! yes they do shine through.